1. Keith Thurman It’s the obvious fight to unify major titles at welterweight. Thurman has been inactive but after beating Danny Garcia in March of 2017 holds the WBA and WBC crowns. With Spence the IBF 147lbs champion, this would be the big fight for the welterweight division. 2. Terence Crawford Crawford has not fought yet at welterweight but he’s that good he only needs to announce he’s moving up in weight to be considered one of the best in the division. He’s skilful, brilliant and a dangerous puncher. Just like Spence actually. 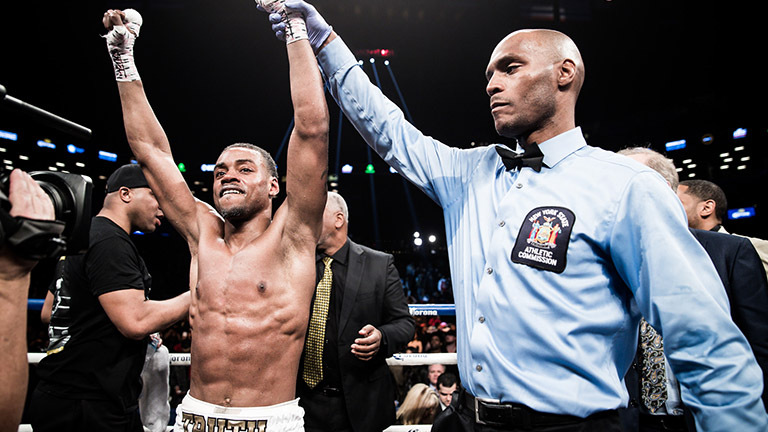 Errol Spence 3. Canelo Alvarez Errol Spence is a potential superstar but he needs a super-fight. With the retirement of Floyd Mayweather, there is a lack of superstars close to him in weight. Perhaps though he could move up to a division (or two) to try to get a fight with hugely popular Mexican Canelo Alvarez. 4. Manny Pacquiao Manny Pacquiao unexpectedly surrendered his WBO welterweight world title to little known Australian Jeff Horn. Pacquiao is long past his best and it could well be an ugly fight if he met Spence at this stage of his career. But “Pacman” is just the kind of star name Spence needs. 5. Sadam Ali The conqueror of Miguel Cotto is now a world champion at light-middleweight, the division above, but could be an appealing challenge for Spence in New York.